You've told your friends and family that you are getting married, you’ve set a date, worked out a budget, viewed a few venues and now it's time to start the hunt for 'The Dress' - but where do you begin? There is an abundance of wonderful dress designs to choose from. There has never been so much choice! From bias cut draping satins to full skirted richly embellished lace. 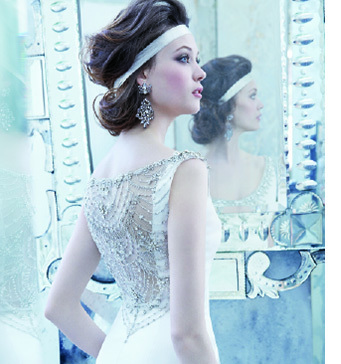 Influences from the 1920's, 30's and 50's are evident in many collections with soft hues of colour subtly introduced. Now it's time to research boutiques in your area, browsing their websites to get a real feel for the service they can offer. Search the internet, look at magazines or even visit local wedding fairs. Be aware of what's available but keep an open mind. Give yourself plenty of time, if possible, as some dresses can take as long as five months to arrive at the shop. In addition to this you will need to have several dress fittings. It's now time to book yourself an appointment. Take a couple of close companions with you, whose opinions’ you value. Having too many people there can make the choice overwhelming and confusing as everyone tries to offer their own points of view. Try a mixture of fabrics, silhouettes and necklines. Give feedback; don't be afraid to say what you don't like about a style as well as what you do like. If you have concerns about which styles flatter your body shape share these with your consultant and draw upon her experience and knowledge to find the perfect dress, for you. So, you've found 'The Dress’! Now make sure you feel completely confident that the shop you are ordering from can truly deliver the 'perfect fit'. Most bridal gowns are 'made to order' not 'made to measure'. Measurements are often taken just to establish the most appropriate size to order in for you. This is then preceded by a series of dress fittings with a highly experienced bridal seamstress a few weeks prior to the actual wedding date.